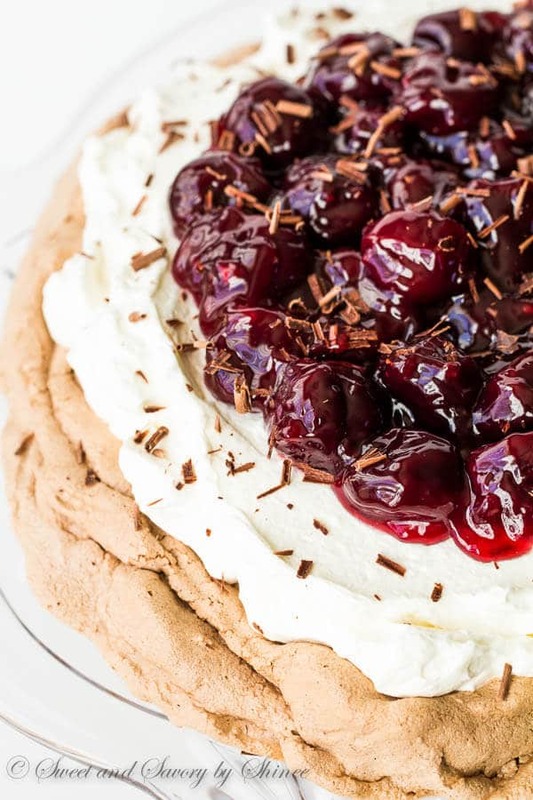 Melt-in-your-mouth light Chocolate Pavlova topped with indulgent sweet cherry sauce. Learn exactly how I make this show-stopper step by step. If you know anything about me, you know I love me some meringue based desserts. French macarons, french meringue cookies, angel food cake, just to name a few! A few years back, I learned to make this stunning Pavlova cake. And if you haven’t tried this delicate cake, you’re totally missing out. I urge you to separate those egg whites and make this deliciousness this weekend. You’ll thank me later. So what exactly is Pavlova cake? 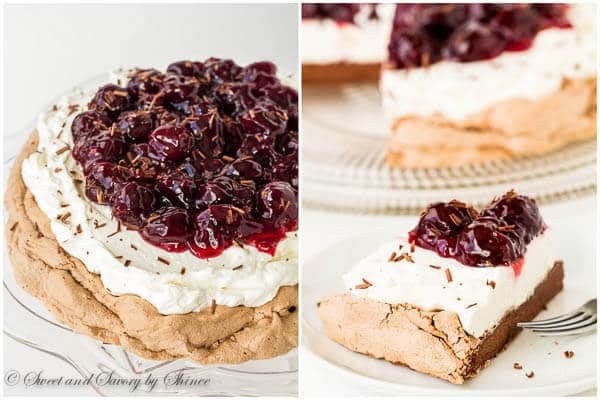 Though the origin of this cake is a big source of argument between New Zealand and Australia, one thing we know for sure is that it was named after a Russian ballerina, Anna Pavlova. This meringue based cake is delicately crisp on the outside, and soft and marshmallow-y on the inside. The beauty of this cake lies in its imperfections. Don’t panic when your beautifully risen cake falls and cracks as it cools. It’s totally normal and actually expected. I’ve shared lots of tips for making this cake in this post. But in short, make sure your utensils for whipping the egg whites are squeaky clean and grease-free, or you’ll never get that beautifully glossy meringue. 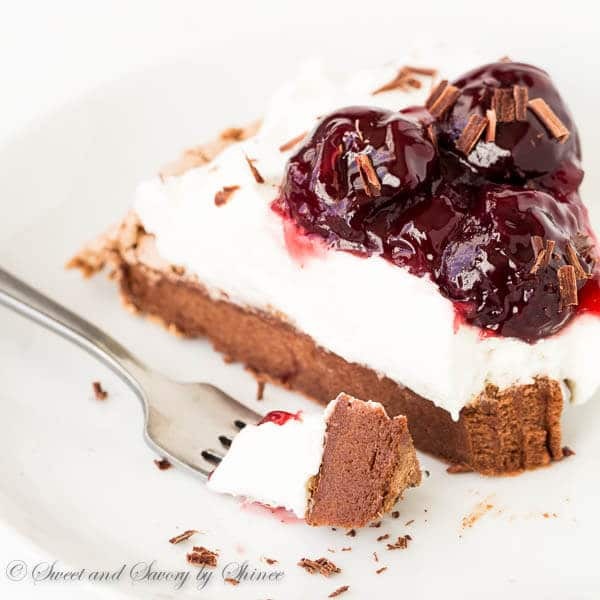 And because cherry + chocolate is everything, I decided to smother the entire cake with indulgent sweet cherry sauce. Plus, it’s hard to find fresh berries in their prime shape during dead winter. The recipe for the sauce is literally my cherry pie filling! So, so GOOD! It really didn’t take long for us to polish off the platter. Pavlova cake is best when it’s served as soon as it’s assembled. The delicate meringue base tends to draw moisture from the whipped cream and gets soggy. Eek, no one wants soggy cake. The good news is that you can prepare all 3 layers separately up to a day in advance, and assemble it right before serving. To make the pavlova, draw 8-inch circle on a parchment paper and place it on baking sheet, ink side down. Preheat the oven to 300°F (150°C). 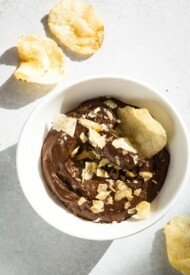 In a small bowl, whisk together sugar, cocoa powder and cornstarch. Set aside. 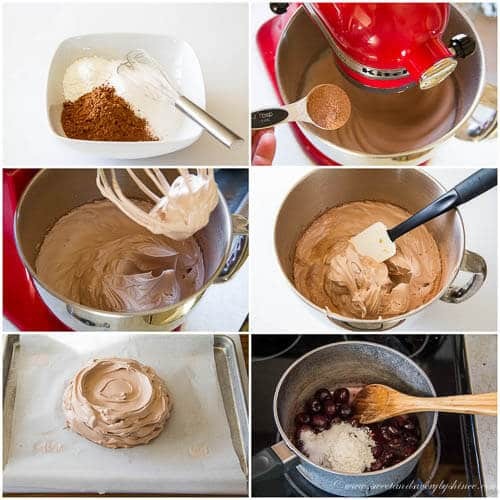 In a large mixing bowl with whisk attachment, or using handheld electric mixer, beat the egg whites until frothy. Stir in cream of tartar and salt and continue to beat on medium high speed. Add sugar mixture one tablespoon at a time, while mixer is running on medium high speed. Continue to beat the egg whites until hard peaks form. The mixture will look smooth and shiny. Add vanilla extract and white distilled vinegar, and gently fold the mixture with a spatula. Transfer the batter onto the parchment paper and spread it inside the circle. Make a shallow well in the center. Bake for 50 minutes. Turn the oven off and let it cool for at least 2 hours with oven door ajar. You can leave it overnight. While cooling, the cake will collapse and crack. This is totally normal. To make the cherry sauce, place the cherries in a medium saucepan over medium heat. Bring it to a boil. Meanwhile, in a separate bowl, mix together sugar, cornstarch and salt. Add sugar/cornstarch mixture, vanilla extract, almond extract and lemon juice into the boiling cherries. Mix well. Reduce the heat to low. Simmer the cherry mixture stirring constantly until thickened, for 4-5 minutes. Remove from heat and cool completely. To make the whipped cream filling, beat the heavy cream with sugar and vanilla extract on medium speed until nice and thick. Keep a close eye on it. Don’t over-whip the cream, or you will start making butter. When ready to serve, gently run a long offset spatula on the bottom of the cake to separate from the parchment paper. 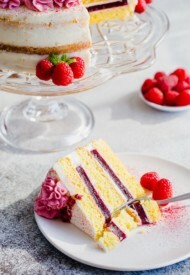 Using a large cake lifter, carefully transfer the cake onto a serving platter. 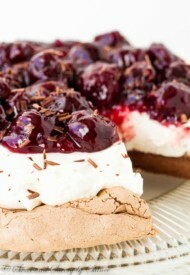 Spread the whipped cream filling over the top of the cake and top with the cooled cheery sauce. Serve immediately. 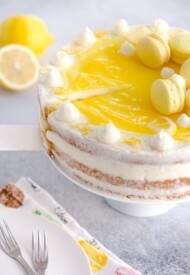 Though this cake is best to serve right away, leftover can be refrigerated for 1 day. To make ahead, bake the pavlova base the night before serving and keep it uncovered at room temperature. Make the cherry sauce and refrigerate. When ready to serve, make the whipped cream filling and assemble the cake. For step-by-step photos and additional notes, read the post above. Could you use a cherry pie filling? Yes, Tricia. 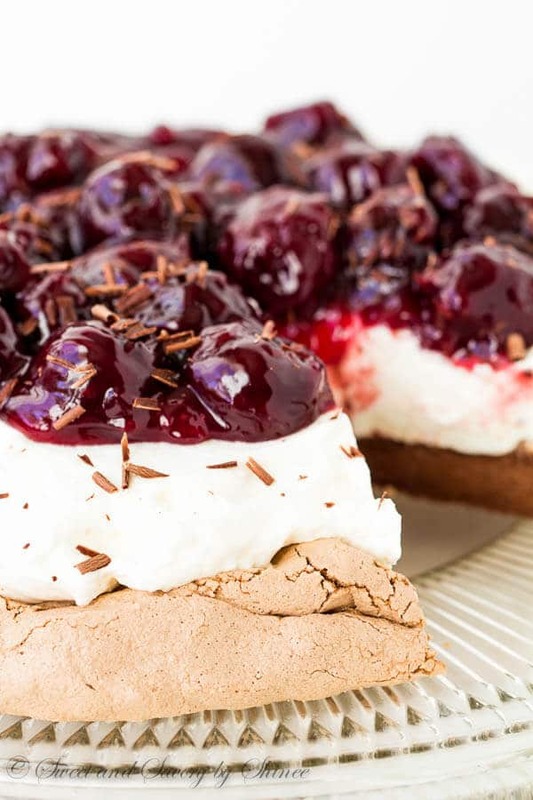 You can use cherry pie filling, if you like it better. I haven’t tried making Palova yet. But, I’m inspired to. Looks yummy.Thanks for joining the Inspiration Spotlight party. Pinned & shared. Hope to see you again soon. Thanks, Theresa! Hope you make that Pavlova soon!